Sidewalk chalk | Living life in the carpool lane.. 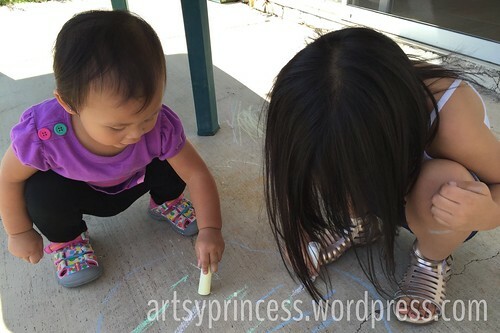 The girls’ latest obsession is sidewalk chalk. For $1, I purchased a pack of 12 pieces at Target. I feel like ‘Super Mom’ because this chalk can keep them occupied for at least an hour, and I didn’t pay an excessive amount of money for it! The girls love it. The back yard concrete is full of colorful drawings and lines. It’s really brought our backyard to life! The Target chalk is great. It gets the job done. It’s chalk. However, I found an old pack of Crayola side walk chalk that we received as a party favor years ago. I brought that out to them for them to try. Crayola chalk is vastly different than Target chalk. Target chalk feels like, well, chalk. Crayola chalk has a creamer and smoother feel. It’s not a dry to touch. Target chalk makes fainter lines on the concrete. Target chalk makes chalky lines. Crayola chalk makes darker, more pigmented, lines. The colors are more vibrant and noticeable. The chalk glides on the concrete in a creamier way. But honestly, the kids don’t care. Chalk is chalk, no matter what the brand. They are having fun with both sets and can spend a whole afternoon out there playing and drawing. I love watching them enjoy some time outside!